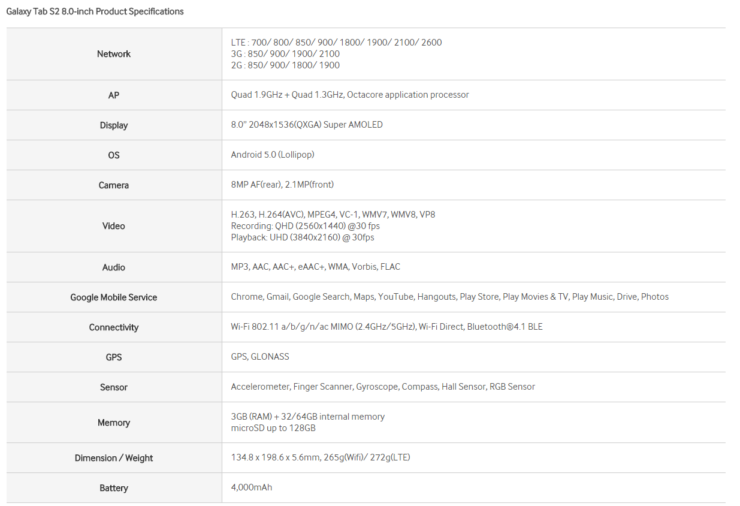 Looks like we are only going to have to muster up a small of patience because Samsung Galaxy Tab S2 slates are going to be released next month, sporting impressive hardware specifications, as is expected from them. The very first difference that you will notice between Galaxy Tab S2 models and Galaxy Tab S ones is that the upcoming ones will have screen sizes of 8.0 and 9.7 inches, as compared to the 8.4 and 10.5 inches that were present on the previous generation ones. While we would have preferred Samsung to maintain these screen sizes for its upcoming models (since bigger is always better), we have better things to look forward to, like better performing components. Here is the interesting thing that we noticed. 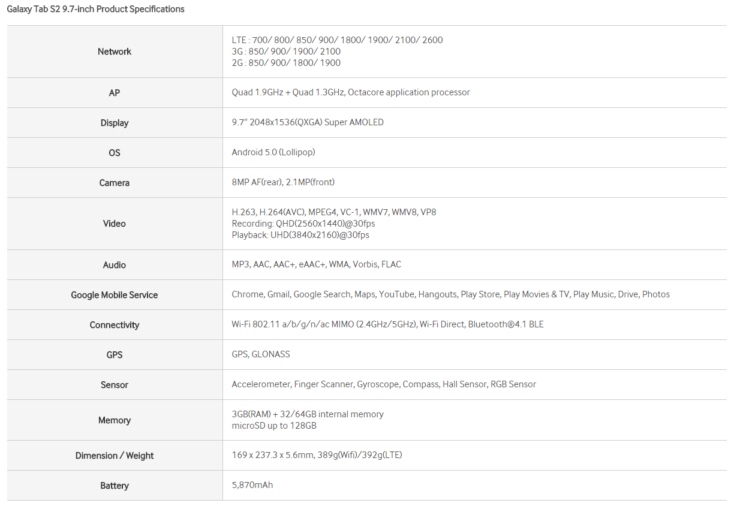 One variant of Galaxy Note 4 (the Exynos 5433 one) is running an octa-core processor at the exact same clock speeds, meaning that both Galaxy Tab S2 models will be featuring an Exynos 5433 SoC. While we were hoping to see Exynos 7420 present in both tablets like the Galaxy S6 family, the previous generation chipset homegrown by Samsung will still provide sufficient firepower to tablet users. Moving on, both Galaxy Tab S2 models will be featuring a Super AMOLED display, which is not surprising seeing as how all high-end mobile devices belonging to Samsung sport this form of display. As for the resolution, both slate models will be resonating a pixel measurement of 2048 by 1536. Furthermore, 3 GB of RAM will be present in both models, although it has not been specified as to which RAM speeds these chips will be running at. Both tablet models will be available to purchase in the 32 or 64 GB internal memory variants, and for added flexibility, a MicroSD slot will be present, allowing users to increase their secondary storage up to 128 GB. However, we were bitterly disappointed to see that Samsung decided to cut corners on the battery side of things. 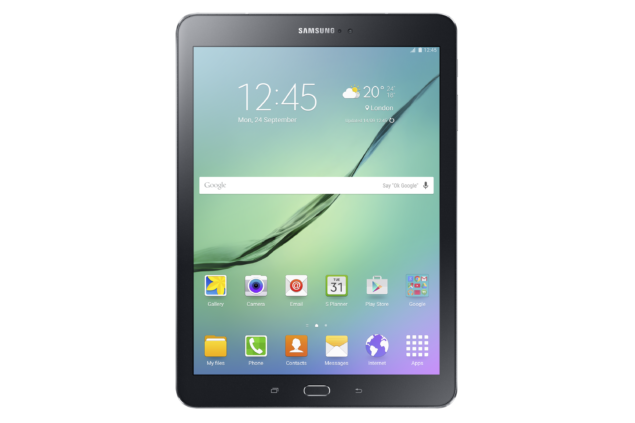 Compared to previous generation Galaxy Tab S models, both Galaxy Tab S2 8.0 and Galaxy Tab S2 9.7 feature smaller battery capacities (4,000 and 5,780 mAh respectively). Since both slates will be running the company’s refined TouchWiz interface, we can expect these models to deliver additional battery life compared to their predecessors. Both tablets will be available to purchase in the Wi-Fi only, or Wi-Fi + LTE models. While pricing details have not been detailed by the source, we expect Samsung to price them along the same range as it did with its Samsung Tab S lineup. Looks like we have run out of details for, but we will continue to update you as soon as these tablets hit the market next month.